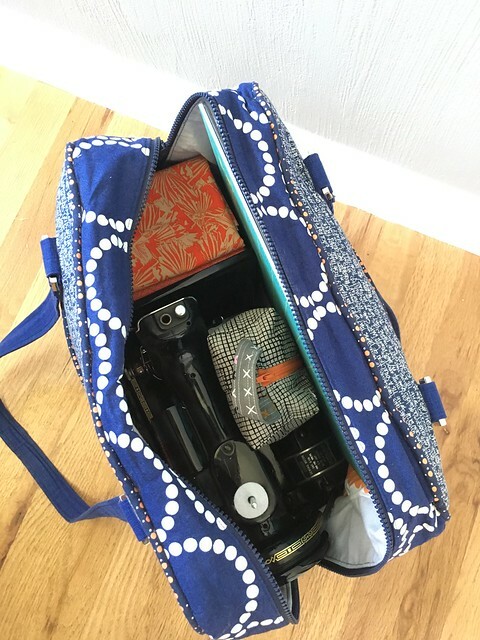 Travel Sewing Kit | What Goes With What? Traveling for a month? How does one travel for a month and NOT sew? That’s the question I kept asking myself. I need my creative outlet but I have a strong desire to travel and explore. Be Brave is my mantra for the year. But how could I take a sewing machine camping. 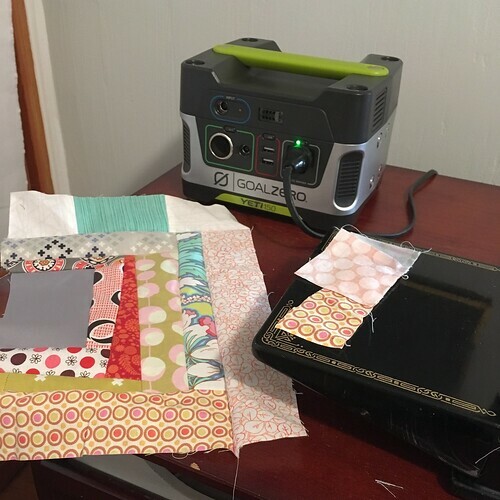 Lucky me… The Viking, my travel partner, has taken to quilting so it didn’t take much to convince him that little MJ [the featherweight] should be our travel buddy. 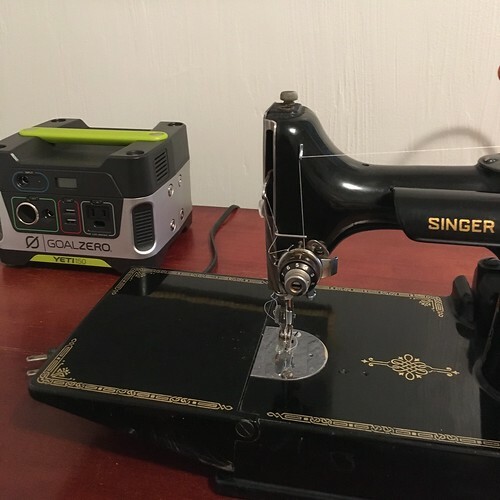 The big question, How do I power a sewing machine in the wild? On IG and Pinterest I see Van Lifer’s running their computers off grid. I watched a few YouTube videos of people powering various home appliances using solar power. What about a sewing machine. How much power did I really need? I found a cute little power generator on sale. Could it power my machine? No one seemed to know. 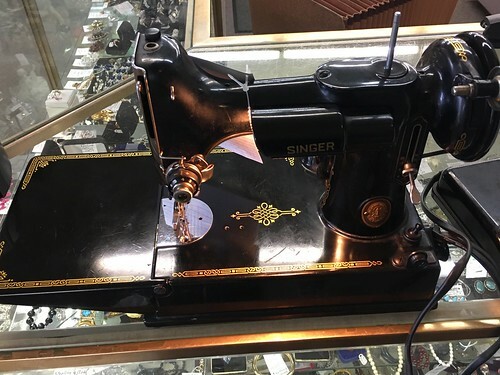 A featherweight sewing machine runs on about 50 watts of power. The Goal Zero Yeti 150 Portable Power Station should power MJ. Right? Well, I couldn’t find that answer online. After some great conversations with the guys at the outdoor shops, I purchased Sparky, 150 watts of power by Goal Zero. If it didn’t work I could always take it back. The Goal Zero Yeti 150 Portable Power Station is basically a power source that can be recharged using solar power, A/C outlet or charge as you go in the car. Ideally I would prefer to have the solar panel. How cool would that be, sewing on the picnic table getting all my power from the sun! In reality, we’re car camping. Sparky will recharge in the car on the go. I could barely sleep the night Sparky arrived. So small and adorable. I plugged sparky into the outlet to charge all night. The next morning I woke at about 5 am with such excitement to see if MJ would run on the 150 watts of power from Sparky. The first surge of power thru MJ my Featherweight was incredible. She didn’t blink an eye! I felt no hesitation or difference in my machine running off grid. I read somewhere that starting a sewing machine with the needle down draws less power. Makes sense but didn’t seem to matter. The first day I sewed for about 1.5 hours and still had 80% of battery left. It works!!!! After 2.5 hours the battery shows 60%. Success!!! Let the adventure begin. Here is a list of my essentials. Of course there will be quilt shops on the road. The Viking and I can’t wait to explore those as well. 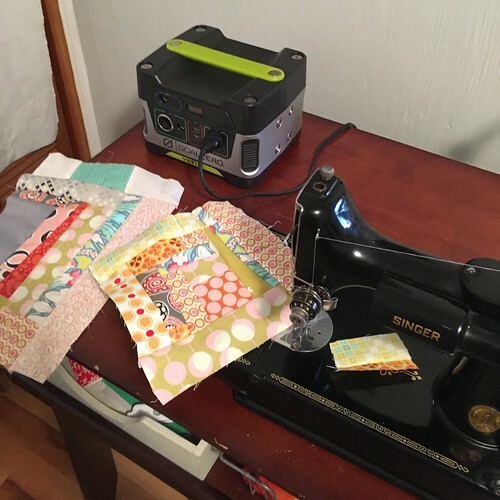 I decided to limit our fabric to 10 fat quarters each. Restraint! I know… It will be hard. I will be posting pics of actual sewing outdoors. Hope you will follow along to see where our adventure takes us and learn about sewing in the wild. 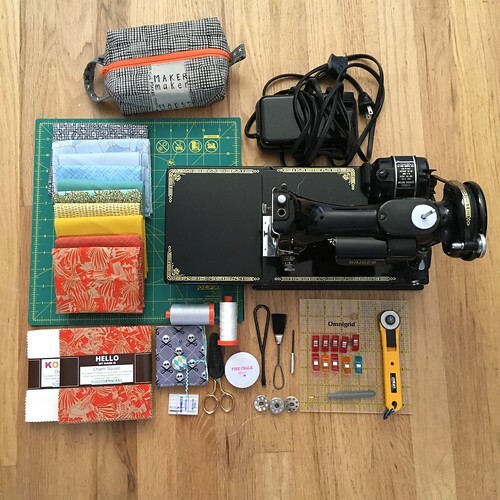 This entry was posted in Adventure, Sewing and tagged Adventure, optoutside, sewinthewild, sewoutside, sewwild, travel sewing kit by Diana. Bookmark the permalink.